Montreal police have arrested a 47-year-old man hours after a bomb threat targeting Muslim students forced the evacuation of three buildings at Concordia University's downtown campus, CBC News has learned. Police said that by 2:30 p.m. ET Concordia's buildings were secure. 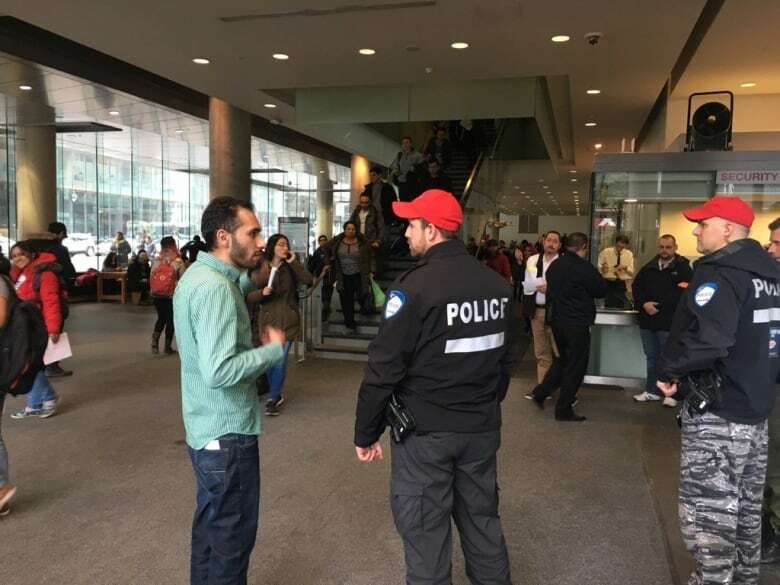 The university confirmed the affected buildings will reopen by 6 p.m.
Montreal police have arrested a 47-year-old man hours after a bomb threat targeting Muslim students forced the evacuation of three buildings at Concordia University's downtown campus. A police team and canine unit were deployed at an apartment on Darlington Avenue in Côte-des-Neiges, it was learned around 2 a.m. ET on Thursday. No other information about the suspect or potential charges is yet available. The three buildings were evacuated after a letter, which was emailed to CBC News, as well as several other media outlets, suggested bombs would be set off at the engineering, computer science and visual arts integrated (EV) complex, and Hall building. The evacuation of the EV complex on Ste-Catherine Street and the Hall Building on De Maisonneuve Boulevard began around 11:30 a.m. on Wednesday. At 12:07 p.m., the university said it also was evacuating the Guy-De Maisonneuve (GM) building, which is connected to the EV building. Montreal police said they found nothing suspicious during their search and handed the case over to the major crimes division. The buildings reopened Wednesday afternoon and evening classes and midterm exams were not cancelled. <a href="https://twitter.com/hashtag/CUstudents?src=hash">#CUstudents</a> if you are concerned about writing exams in light of events on campus today, pls contact your professor directly to discuss. The threatening letter, purportedly from a group that calls itself Council of Conservative Citizens of Canada (C4), complained about Muslim students at Concordia. "The suspect sent by email that he put some explosive items inside a few places inside the buildings," said Montreal police Const. Benoit Boisselle. Quebec Premier Philippe Couillard said when he heard what was happening at Concordia, his first concern was everyone's safety. "It's a despicable act that must be condemned by all of society, but my first concern is safety," Couillard said. Concordia University spokesperson Chris Mota said she was alerted to the threatening email at 9 or 9:30 a.m. She said Concordia administration contacted Montreal police immediately, and it was a police decision to evacuate the three downtown buildings later in the morning. "It is a police operation. It is not a university operation," said Mota. "We do follow their lead, and we follow their timeline." She said the university has been in touch with Concordia's Muslim Students Association, ensuring its members are safe and secure. She said the university viewed the threat "not only as a threat to one particular portion of our population, it is a threat to the entire population." "From the perspective the university, a threat against any group is a threat against all of us, and we are going to come together and make sure everyone comes out of this fine." Concordia University president Alan Shepard echoed those statements later, saying that Concordia is an inclusive institution. "We have students from 150 different countries and many faith communities, and everybody's welcome," Shepard said. Concordia says that all activities in the John Molson School of Business on Guy Street are continuing as usual. Right after the evacuation order, there was some confusion about Metro service at Guy-Concordia station, which is linked by tunnel to the buildings being evacuated. However, Montreal's public transit agency (STM) said service is continuing as usual. Const. Boisselle said that between 10 a.m. and 2:30 p.m. the officers, assisted by the canine unit, conducted their search. He said investigators are now working to find the main computer which sent the threatening emails. "We don't take anything for granted," he said of the quick response. Since the letter mentioned a 48-hour window, Concordia says it will increase patrols of its private security officers. Montreal police will also be present outside the campus for the next few days. CKUT — the campus community radio station at McGill University — was among the media outlets to receive the letter threatening Muslim students at Concordia. "Since we will [spread] our fight to McGill too, we at C4 decided to give you a heads up of the emergency situation at Concordia University," said the email, from someone identified as the "C4 co-ordinator." An official at CKUT said the radio station had shared the email with McGill University's campus security. Quebec's Higher Education Minister Hélène David said that since no specific location was named at McGill University, the approach on how to deal with it was different from Concordia. Const. Boisselle said McGill decided not to evacuate and that it is "taking care of it themselves with the security they have."